...just look at that variety! To me it is so magical, so amazing that you can find such gorgeous grain colors and patterns. It takes this title of favorite wood from the special qualities of the tree. In fact the best Madrone wood comes from the most rugged of the trees because they create the densest wood in their fight to survive the harsh climate and tough terrain, growing mostly on craggy bluffs and heights. 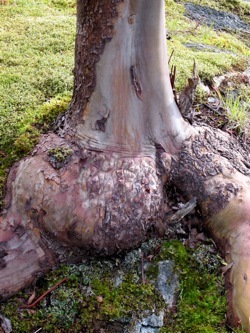 Arbutus trees are very strong trees and the wood can be the hardest of hardwoods! While in general the wood is even harder than red oak and other domestic hardwoods, the wood can dry on the tree to an even harder density. This can happen as the tree starts to die. The main trunk will open and expose the heartwood center and then it slowly dries over many years. 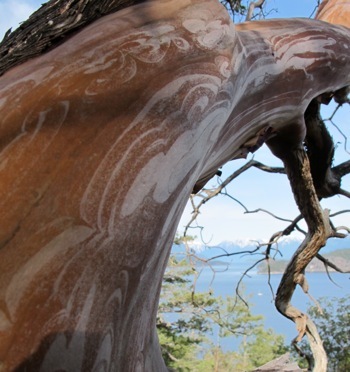 These spectacular colors and grain formations are actually quite rare, only a small number of Madrone trees or portions of a tree will exhibit these qualities. 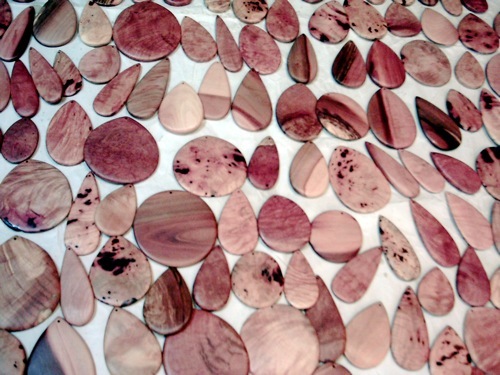 Contrary to what most people think, most Arbutus wood is light in color: creamy white to light browns and light pink. When admirers see the darker shades of the bark in the summer, they think that is the color of the wood inside! The higher up the tree and the newer the wood, the whiter it tends to be. 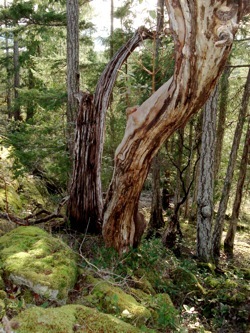 The older Madrone wood can be a lovely salmon pink color and even darker near the center heartwood on very old trees. 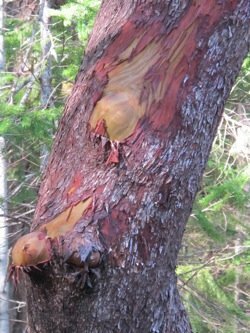 Arbutus tends to die slowly from the inside out as it ages, often leaving part of the center hollow and the wood much darker than new growth. Some of the Madrone wood can be almost an ivory white...these are quite rare to find and are stunning, just like the almost reddish black colors can be from dead trees. The wood also will slowly darken a bit with time when exposed to the air, as most wood will do. Whichever color of Arbutus wood you find, you will be delighted by how gorgeous the wood is. The combination of such a wide range of color and exciting grain patterns yield a wood of infinite variety to the woodworker. The roots too can be used but are almost impossible to sand as they are so hard and tough that they burn your sandpaper and leave burn marks on the wood! It takes a lot of time and sandpaper to finish wood crafts from the roots or burls. Each Madrone tree or branch is a mystery. When you first cut into it, you always wonder what color and texture you will discover inside. I only use fallen trees and dead branches and occasionally salvage wood when people need to take down a danger tree that leans over their house. Eco friendly wood at its best! You can't easily get long straight timbers because of the Madrone tree's crooked shapes and many branches. The wood is notorious for splitting and cracking as it dries. Once dry though the wood is very stable. These features limit its use in commercial applications. Some Madrone hardwood flooring can be found but it will be quite expensive! Because of its hardness, Arbutus wood finishes to the most smooth of satin glory! It matches the sensual feel of the new bark that renews every year on the trees. You can find wonderful smaller pieces for wood turning and smaller wood art craft projects. Spalting happens to Madrone wood when a fungus starts to change the composition of the wood when the tree or branch is lying on the ground or standing dead for a long time. If you catch it early, the wood is still as hard as ever but has splotches of colorings sometimes with black lines in it that add to the marvel of the wood. If left too long on the ground, the wood will quickly rot and wood worms will eat into it, hastening its decay. You often have to cut your way through some pretty funky wood before you find the gems hidden inside! Quilting happens to Arbutus wood when pressure from other trees or fall-downs causes the wood to bend, change direction and form little quilted ridges in its cell structure. This wood looks wonderful when sanded, giving a gorgeous quilting effect often crossing the grain direction. Burls are a marvel of the Arbutis tree. Usually found at the base, but sometimes higher up on the tree, burls store water for release during droughts. The cell structure of the burl wood is remarkable and it creates birds-eye formations and exquisite swirls. Like the roots, it is so difficult to sand Madrone burl wood. Madrone burls will often grow around rocks completely encasing them ... Many woodworking tools and chainsaw blades are destroyed when encountering one of these hidden hazards! The risk of stones inside combined with the Madrone burl hardness make them very tricky and time consuming to work with. you can get some fresh wood. It is a pleasure to cut as it smells so good inside...vibrant and delightful! Now imagine this! Madrone wood is so dense that when a piece of wood is fresh, it will sink in water and not float! Does anyone know of other trees that do this? 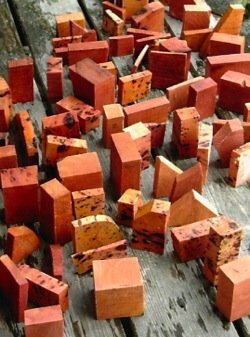 As a firewood, Pacific Madrone wood is ideal as it burns very hot leaving few ashes. All my wood scraps are used to keep the stove going in the winter. Such a nice by-product of my wood crafts! In summary, the Arbutus tree produces such a thrilling wood, you can never be bored by its wide range of colors and textures. Madrone wood also finishes to the smoothest of smooth, so it is always a delight to use. These qualities combine to make it the winner as my favorite wood! ... Mt Denman again. 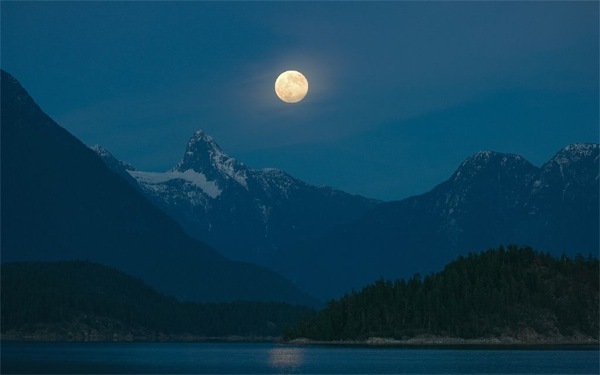 I guess by now you realize how much I adore that mountain! Hard to beat this picture!